Vincent L. Sheehan was born in April 1896 at Wisconsin. He was the son of James M. Sheehan and Mary Jane Kane. John H. Sheehan was born circa 1903 at Wisconsin. Lawrence Benseman was the son of Henry J. Benseman and Mary E. Sussner. Harold Franklin Wegmiller married Elizabeth Dora Schuette, daughter of August Wilhelm Schuette and Ida Caroline Krause, on 16 June 1940 at Wisconsin Elizabeth Schuette and Harold Wegmiller marriage announcement. Name Variation Charles Schuyler Carpenter was also known as Scotty. Name Variation Charles Schuyler Carpenter was also known as Schuyler. Charles Schuyler Carpenter married Irene E. Schuette, daughter of August Wilhelm Schuette and Ida Caroline Krause. Charles Schuyler Carpenter was born on 8 December 1913 at Wisconsin. He died on 15 August 2006 at Colorado at age 92. Ray Krueger married Ester Schuette, daughter of August Wilhelm Schuette and Ida Caroline Krause. George Volk married Delia Fargen, daughter of John Fargen and Bridget (?). George Volk was born in 1875 at Buffalo, Erie, New York. He was the son of Peter Volk and Margaret Yoerg. George Volk died in 1946 at Wisconsin. Married Name 26 June 1943 As of 26 June 1943,her married name was Fagan. Margaret L. Kirk was born on 15 January 1911 at Walla Walla, Washington. She married Mathew Patrick Fagan, son of Patrick Stephen Fagan and Norma Lucille Cantrill, on 26 June 1943 at Superior, Mineral, Montana. Margaret L. Kirk died on 10 July 1979 at Pacific, Washington, at age 68 Margaret (Kirk) Fagan obituary. She was buried after 10 July 1979 at Ilwaco Cemetery, Ilwaco, Pacific, Washington. Herbert Sidney Dail was born circa 1886. 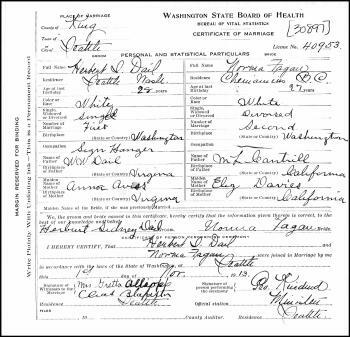 He married Norma Lucille Cantrill, daughter of Millard Lionel Cantrill and Elizabeth Jane Davis, on 1 November 1913 at Seattle, King, Washington. Herbert Sidney Dail died on 14 February 1919. Married Name 2 December 1917 As of 2 December 1917,her married name was Cantrill. Edith Martha McFadden was born on 17 December 1898 at Ganges, British Columbia, Canada. 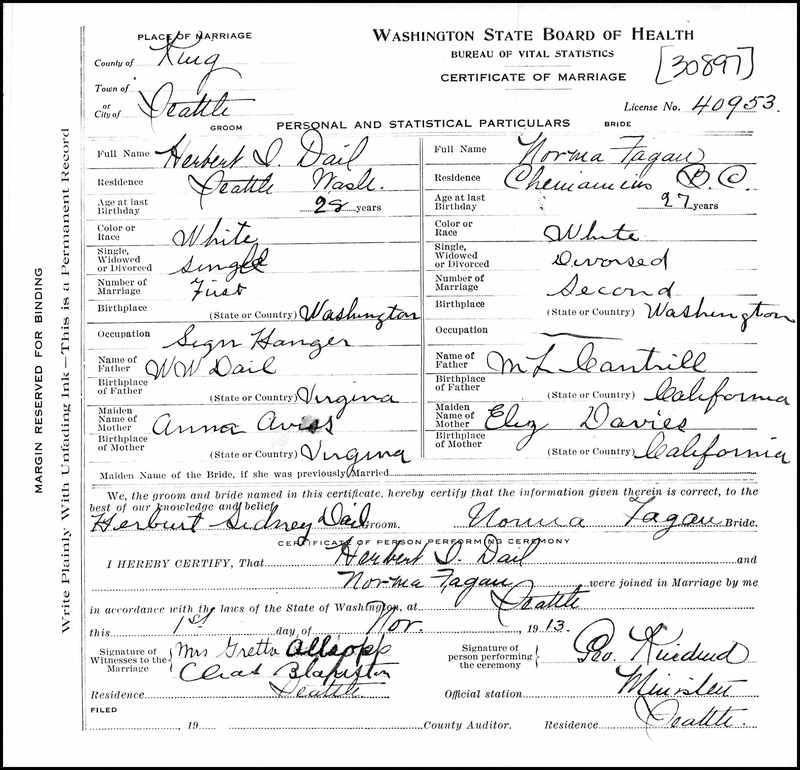 She married William Monroe Cantrill, son of Millard Lionel Cantrill and Elizabeth Jane Davis, on 2 December 1917 at Saltspring Island, British Columbia, Canada. Edith Martha McFadden died on 29 January 1991 at Ganges, British Columbia, Canada, at age 92. William Millard Cantrill was born in 1918 at Ganges, British Columbia, Canada. He was the son of William Monroe Cantrill and Edith Martha McFadden. William Millard Cantrill was buried in 1973 at Ganges Provincial Cemetery, Ganges, Capital Regional District, British Columbia, Canada. He died in 1973 at Victoria, British Columbia, Canada. Married Name Her married name was Derkson. Elizabeth Martha Cantrill married (?) Derkson. Elizabeth Martha Cantrill was born circa 1920 at British Columbia, Canada. She was the daughter of William Monroe Cantrill and Edith Martha McFadden. Elizabeth Martha Cantrill died on 6 July 1984 at Victoria, British Columbia, Canada. (?) Derkson married Elizabeth Martha Cantrill, daughter of William Monroe Cantrill and Edith Martha McFadden. (?) Holbrook married Lucille M. Brewer, daughter of Clifford L. Brewer and Katherine J. Rempp. Raymond Mount and Mary Jane Brewer were divorced. Raymond Mount married Mary Jane Brewer, daughter of Clifford L. Brewer and Katherine J. Rempp. Larry Rempp was the son of Frank Philipp Rempp and Julia D. Martens. Married Name Her married name was Welsh. Marjorie Gail Doran was the daughter of Justin Ezra Doran and Frances Margaret Rempp. Marjorie Gail Doran married Stanley R. Welsh. Stanley R. Welsh married Marjorie Gail Doran, daughter of Justin Ezra Doran and Frances Margaret Rempp. Justin Dwayne Doran was the son of Justin Ezra Doran and Frances Margaret Rempp. Justin Dwayne Doran married Florence Brodere. Married Name Her married name was Doran. Florence Brodere married Justin Dwayne Doran, son of Justin Ezra Doran and Frances Margaret Rempp. Erla Cleopha Doran was the daughter of Justin Ezra Doran and Frances Margaret Rempp. Erla Cleopha Doran died at died young. Darrel Dean Doran was the son of Justin Ezra Doran and Frances Margaret Rempp. Darrel Dean Doran married Irene Smith. Irene Smith married Darrel Dean Doran, son of Justin Ezra Doran and Frances Margaret Rempp. Married Name Her married name was Sluka. Dorothy Jean Doran was the daughter of Justin Ezra Doran and Frances Margaret Rempp. Dorothy Jean Doran married Donald L. Hanson at 1st marriage for her. Dorothy Jean Doran married Jacob Patrick Sluka, son of Adolph John Sluka and Mary Catherine Svoboda, at 2nd marriage for her. Donald L. Hanson married Dorothy Jean Doran, daughter of Justin Ezra Doran and Frances Margaret Rempp, at 1st marriage for her. Jacob Patrick Sluka was the son of Adolph John Sluka and Mary Catherine Svoboda. Jacob Patrick Sluka married Dorothy Jean Doran, daughter of Justin Ezra Doran and Frances Margaret Rempp, at 2nd marriage for her. Gary Eldon Doran was the son of Justin Ezra Doran and Frances Margaret Rempp. Gary Eldon Doran married Lois Roach. Lois Roach married Gary Eldon Doran, son of Justin Ezra Doran and Frances Margaret Rempp. Betty Ann Doran was the daughter of Justin Ezra Doran and Frances Margaret Rempp. Betty Ann Doran married Jerry Chamberlain at 1st marriage for her. Betty Ann Doran married Randy (?) at 2nd marriage for her.